Material and Finish: Double powder-coated steel posts with matching steel top rail. Description: Ithaca Style cable railing for the exterior deck of a modern wood and glass house. Photos by Scott Francis. 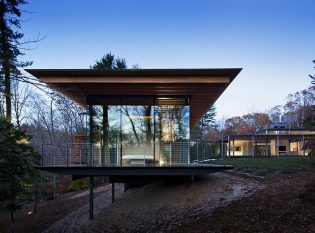 The world-famous Japanese architect and professor at the University of Tokyo, Kengo Kuma, created a contemporary masterpiece in the woods of New Canaan, Connecticut. 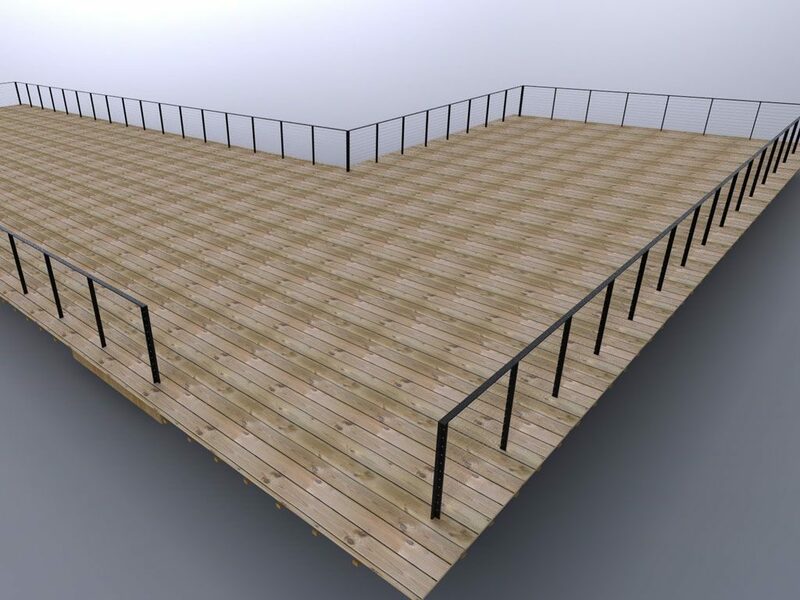 Keuka Studios is extremely proud that our cable railing was used for the project. 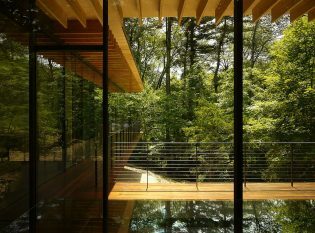 Kuma transformed the personal residence of mid-century modern architect John Black Lee who designed the original building in 1956. Kuma added an L-shaped wing, deck, and roof in 2010, giving the home a luxurious, modern look from the inside out. 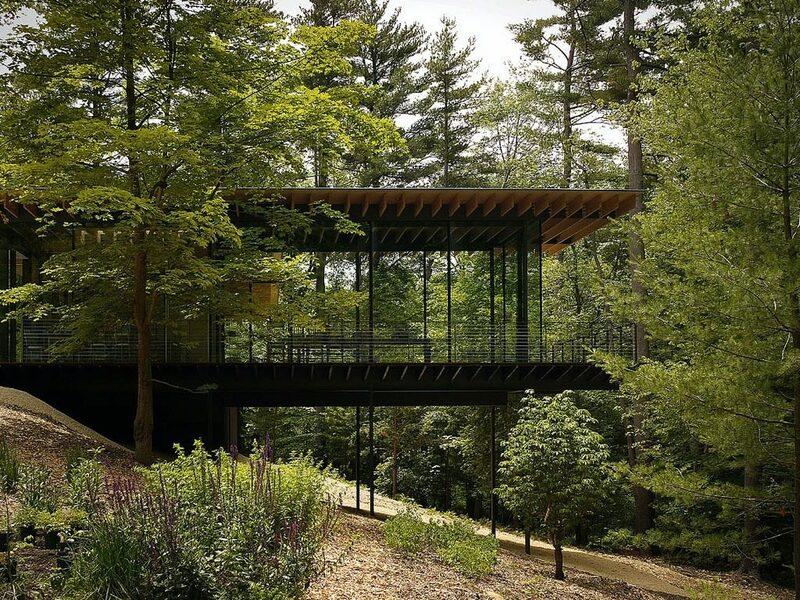 Now referred to as the “Wood and Glass House,” the building’s transparent design beautifully accentuates the home’s natural surroundings. 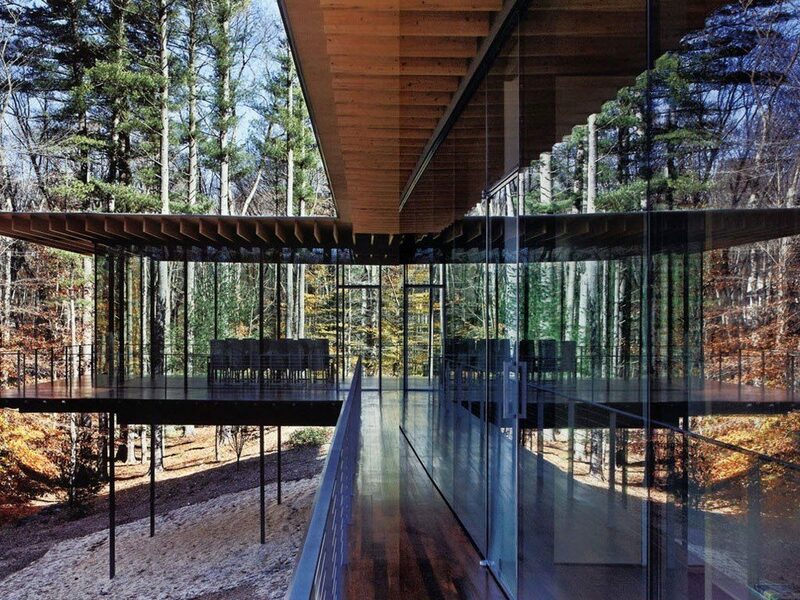 A walkway enclosed by glass connects the original symmetric box structure to the L-shaped wing created by Kuma. 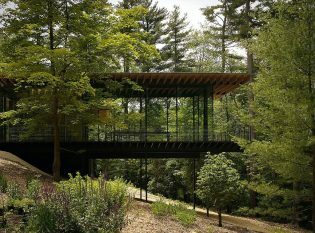 For the addition, Kuma devised a floating structure supported by very thin steel columns that lift the house 17 feet above the grade. Metal columns covered by Low-E coated glass support the roof. The transparent design carries into the house as well; LED-lit mesh screens make up the interior partitions. 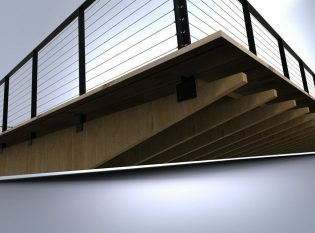 Kuma’s addition also includes a roof-covered wraparound deck. 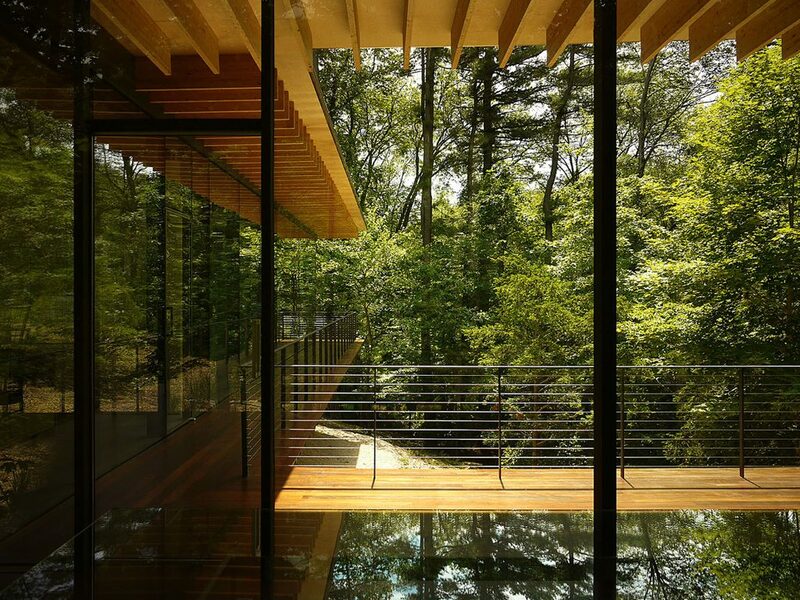 Even more so than the glass-enclosed interior, the exterior deck creates the sense that the building is innately fused with its stunning natural surroundings. 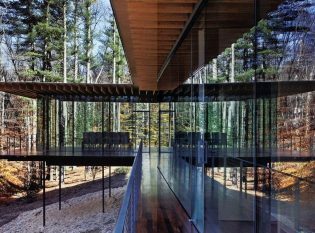 In order to preserve the panoramic views and maintain the harmony between the building and the forest that encompasses it, Kuma wanted the deck’s railing system to be as transparent as possible. The clean and minimalist design of our Ithaca Style railing perfectly fit the bill for Kuma’s remodel. The ultra-thin top rail and railing posts on our Ithaca Style cable railing have a clean and minimalist appearance that accentuate rather than detract from the view through the railing. We also crafted a custom L-shaped single post for each corner of the deck by joining two flat bars that are half of an inch thick. Because of the railing’s slender, unobtrusive design, we used steel for the entire railing to make it sturdy but not bulky. To match the exterior of the home and provide corrosion resistance, chose a double powder-coated bronze finish for both the railing posts and the top rail. In the spirit of simplicity, we made every effort to conceal the hardware throughout the railing system. For example, we custom designed base plates for railing posts that rest on sleepers hidden underneath the deck’s IPE surface. All throughout the welding and grinding process, we took great care to keep internal and external edges at a small radius. We also pre-drilled and tapped the steel top rail and posts before the wood decking was placed around the posts.